I always keep a packing checklist in my computer for items of my absolute essentials to pack for every trip (chargers, facial cleanser, daily sunscreen, medicine, maps, etc.). It makes last-minute packing a LOT less stressful because there’s always a checklist for reference. Most importantly, it helps me remember the essentials that I might forget. If you don’t have a checklist, consider making one now! I usually don’t use hotel toiletries because I’m a fussy person (unless they’re luxury brands haha). Therefore, packing toiletries can be such a nightmare for me. Finding a bunch of small bottles at the very last minute is unlikely to be successful too. Instead, I always keep a separate bag of toiletries pre-packed and ready to drop-in my luggage – basically, duplicates of everything I use for my daily routine. As I’ve mentioned above, finding small bottles can be difficult. Hence, the easiest way is to buy cosmetics samples. I often stock up my Korean skincare and make-up products from RoseRoseShop (I’m not affiliated with them), and they sell all sorts of cosmetics samples at amazing prices. Hence, I find it easier to use these samples than re-packing them into travel-sized containers. Wow, this is my #1 travel must-have! 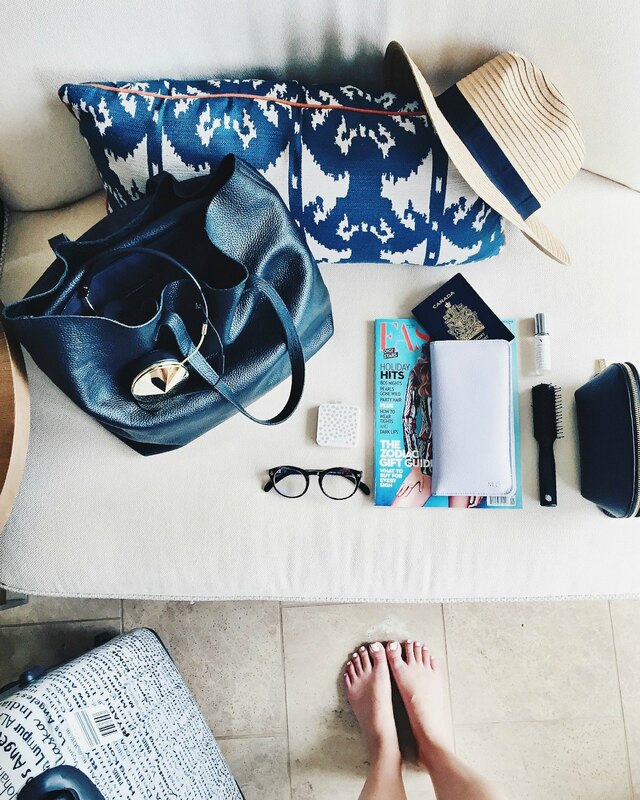 I’m a sucker for all sorts of travel organizers (who else is? 😆 ). They keep me organized during the packing and easier to use than regular cosmetic pouches or wash bags. They often have a mesh front and are made out of very light waterproof material which allows packing of a lot of items without bursting apart. I’m not a fan of clothes rolling, I prefer to fold my clothes flat and pack them into packing cubes. And I pack my clothes by days, instead of by types. What do I mean? Well, I’ll pack the clothes for the first 2 days into one cube, and every subsequent 2-3 days into separate cubes (depending on its size). So, during my travel period, I’ll open only one cube at a time without disturbing the rest of your clothes. The best thing about travel organizers is – they come in various colours, shapes and sizes. They are perfect to compartmentalise your clothes. I always have a separate one to keep smaller items such as undies and socks, and a spare one for dirty clothes so nothing gets mixed up. If you haven’t try it, I highly recommend that you do. Choosing the right luggage is one of the best things you can do to make traveling easier. Other than some of the basics such as sturdy wheels, durable handles and ample space, plenty of luggage now offer extras such as charging ports and built-in scales. One of my favourites is the built-in scale (prevents over-packing and excess baggage fees). Let’s be honest, you don’t need new outfits daily during your trip. You’re never going to wear everything you pack. I always do one round of checking after I pack. Every time when I do this, I can definitely remove a few items that I don’t think I’ll need for my trip. That way, I can reduce some space and weight off my luggage too. In general, don’t bring anything for the sake of having or just in case. 💡 A small bottle of fabric freshener could be your best friend if you intend to re-wear your clothes plenty of times. No! 😮 Your kids might scream if they hear this, haha. I usually pack my tablet loaded with games and videos into my carry-on baggage for the flight. I’ll also pack a small plushie (for sleeping, Edison not me haha!) and a book in the luggage, that’s it! The purpose of vacation is to go out and do things together, so the kids don’t need a bunch of toys at the hotel to keep them occupied. Milk, snacks, sanitizers, diapers etc. can all be bought at your destination. I only pack two days of supplies at most (in case I don’t have time to buy on the first day). And this way I don’t have to lug these items around the airport. Don’t just throw them in, please… 😮 For my cords, I roll them up and secure them with a binder clip or clothes peg so they don’t come unrolled in transit. And I put them all into a travel organizer. This keeps them from getting tangled, and I know I have them all in one place whenever I go. Easy peasy, neat and tidy – am I right? I have a small zippered pouch that I always put in my carry-on baggage. In it, I stash all the things I want to keep with me on a flight (such as headphones, sanitizer, wet tissue, some cash, etc.) so that when I board I can just pull that pouch out, put it onto my seat, and then place my carry-on in the overhead bin quickly. What are your favourite packing hacks? Share your favourite tricks and tools in the comments! I love to hear from you too. Travel-size fabric refresher is my savior too, get rid of smoke smell and body odors instantly.. freshness on the go with just a simple spray.. brilliant idea!